So all those who lost the Madballs they had as kids (and even those who kept their Madballs just to realize they’d disintegrate over time), fret no further. They’re back! You remember Madballs. They actually had success in the mid 80s, combining the gross-out character style of Garbage Pail Kids and the playability of a ball. Well, it’s 20 years later and some of your old favorites are back and have been redesigned to be even more disgusting. The modern Madballs are brought to us by Basic Fun and American Greetings (freaky huh?). Each series has 5 classic characters from the original 80s line with the addition of a new modern character. The characters available in this first series are the ever-popular Screamin’ Meemie, Skull Face, Bash Brain (known as Crack Head back in the day), Repvile, Slobulus and Horn Head. Screamin’ Meemie – Shatters glass by screaming like a little girl. Skull Face – The bare bones minimum. And that’s on a good day. Bash Brain – Brains and brawn: He has neither. Repvile – Fair Warning: Does not make a good pet. Slobulus – Gross. Vile. Disgusting. Lacks Vision. ‘Nuff said? 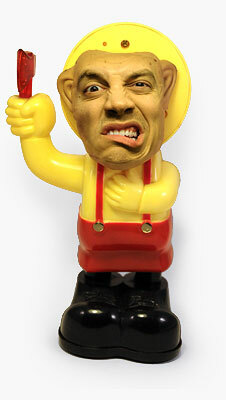 Horn Head – Just cranky enough to bully the bullies. These toys are foam rubber balls like the originals, but there’s another new Madballs series called Madballs Sick. They are slightly larger rubber balls that reveal gross gags when you squeeze ’em. Bulging eyes, pulsing brains, oozing blood and all that kind of stuff. Here’s a shot I found online (I don’t like them that much, that’s why I’m only presenting the classic foam rubber ones). 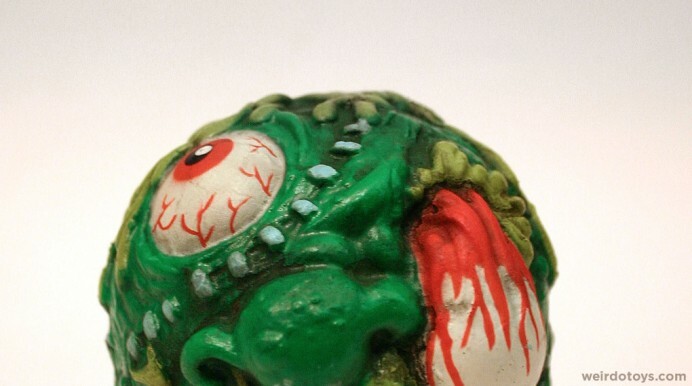 What I’ve enjoyed even more than the new Madballs is the Madballs Central blog started by Madball artist, James Groman. Here’s a taste of some of the awesome sketches and paintings he’s posting on the site (I wish the toys turned out as well as his original artwork). American Greetings? Seriously? The same American Greetings that makes all those mushy cards? Yep. They actually created the originals through a subsidary company, AmToy. It’s good to see what they can do when they don’t have to be so sweet and lovey-dovey. 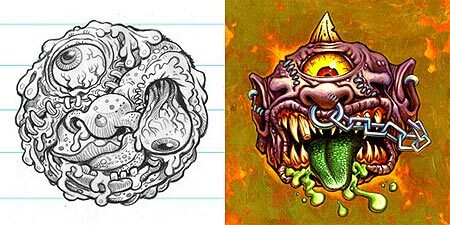 Madballs were/are so frickin’ cool. My little brother and I used to play whiffleball in our backyard with one of ’em…trying to come up with crazy, curvy pitches that took advantage of the uneven surfaces. 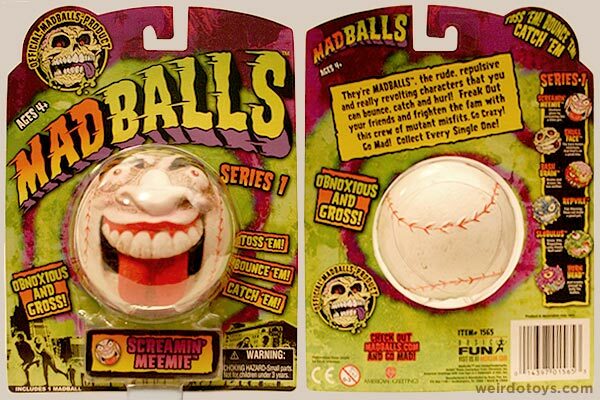 I actually had the Screamin Meemie madball at one point in my life. And I had forgotten all about the Garbage Pail Kids. If I were to give my son a Screamin’ Meemie ball today, he’d roll his eyes… and my wife would beat the crap out of me. After a long time of searching through my parents attic, I finally found what I believe to be is one of the rarest Madballs-related pieces- one of the Creepy Bods, Dr. Gutz to be exact. He’s a headless rubber body on which you were to place a regular foam Madball. I have searched everywhere and the only reference is on the Japanese page you have mentioned before- nuttynuts or technodrome. I can’t find any info on the company that made them. If anybody has any info let me know. never saw one up for auction before. By the way, great website, and I look forward to more! I picked up a few of these at Toys R Us last night for my nephew’s birthday, and grabbed a couple for myself as well. They are really nice. Gross, ugly, hilarious nice. I’m looking forward to the 2nd series. I sold my original ones on eBay years ago, and later regretted it. But now I can own them again. Does anyone remember freakballs? They came out about 10 years ago or so. I still have some of those. They’re not as cool as Madballs, but they’re still pretty good knockoffs. Nice detail and paint jobs. They only made one series of them as far as I know before they vanished. Oh well. Memories…! hell yeah. i totally forgot about those. @ Boogie bot – I don’t ever remember seeing Freak Balls. I’ll have to check ’em out. i just spotid some ko mad balls at dollar tree ther calld squirtdevil. Madballs disintegrate? Oh, no? I wonder if they’re a bunch of powder in my storage unit.